Ambrose was chosen by acclamation of the people to be archbishop of Milan. 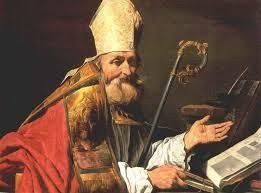 Summary of St Ambrose, Bishop, Doctor of the Church Born in Trier (Germany) about 340. Ordained bishop on this day in 374 and died at Milan (Italy) on Holy Saturday 397. A lawyer who became governor in Milan and who was still a catechumen when elected bishop by popular acclaim. Upheld orthodoxy against the Arians and won many Christian converts. Encouraged monasticism and defended the independence of the Church against secular authority. Honoured as an outstanding pastor through his writings on the sacraments and Christian ethics and through his homilies, instructions, and hymns. Like St Martin of Tours, Ambrose was a Roman army man. The Christian ethos had come into the army through the conversion of Constantine. Ambrose’s status was such that he was chosen by acclamation of the people to be archbishop of Milan. Desmond O’Grady tells his story. Inculturation, the embodiment of the faith in a culture, has become a buzz word. One of the most successful examples, surely, was the melding between Christianity and the culture of ancient Rome. St Ambrose had a vital role in this. Right from his birth, Aurelius Ambrogius was destined for an important role in the empire. Born in Trier on the Rhine in AD 339, the son of a Roman senator, who was also Prefect of Gaul, he became a lawyer and a senator, and the Governor of the Italian provinces of Emilia and Liguria, with his residence in Milan. He was a VIP of the imperial admin­istration but left it to become the Bishop of Milan. 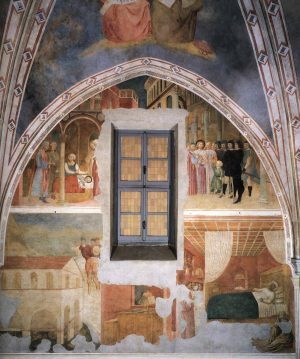 According to one biographer, he went as a Roman official to a Milanese church to ensure order during the election of the bishop and, although he was a layman, he himself was chosen after a child cried out, ‘Ambrose for bishop!’ This episode is depicted in a fresco in San Clemente Church in Rome. ‘Violence was done to me,’ wrote Ambrose later, referring to his election. He was only thirty-­five! Whatever way he was elected, he proved to be an outstanding bishop in a long reign from AD 374 to AD 397. He was the corner­stone of the Milanese Church which still has its own rite, the Ambrosian, dating from his time. In it the Mass is structured some­what differently from the Roman rite and the canons also differ. Ambrose was also a significant figure beyond Milan, partly because it was the seat of the Emperor of the West. After Emperor Constantine accepted Christianity early in the century he had shifted the capital from Rome to Constantinople but the western part of the empire was ruled from Milan. In Ambrose’s time, eminent members of the Roman Senate still retained their pagan beliefs and their attachment to classical tradition. They were afraid that Christianity was an offence to those gods who had ensured the empire’s greatness; some of them worked for the restoration of paganism, as was the case during the reign of Emperor Julian the Apostate, who died only twelve years before Ambrose became bishop. Ambrose played a key role in mounting opposition against persistent paganism. At the same time, Christianity was tragically divided, with Arian heretics, who claimed that Christ was inferior to God the Father, threatening to prevail. And barbarians were making inroads into the empire. Ambrose responded ably to all these problems, insisting on the need for unity and hence for discipline. 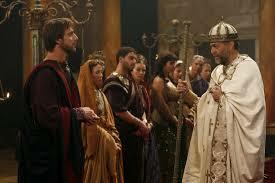 He retained a Roman senator’s sense of order and diplomacy, but put them at the service of the Church. He was related to some of the leading senators, had attended their schools and shared many of their tastes. He was far from being the only Christian senator but his family must have been one of those with the longest Christian traditions. A relative, Severa, had been a martyr under the Emperor Diocletian at the end of the third century. His sister, whom he described as ‘dearer to me than life and the light of my eyes’, was a consecrated virgin. She seems to have been the leader of a community of Christian women who lived in her residence, which is now a Benedictine monastery near the Roman ghetto. Ambrose lived under two Arian Emperors, namely Constantius II and Valens, while three other Emperors – Gratian, Theodosius and Valentinian – accepted his guidance. He once affirmed that Emperors were not above the laws of the Church, an affirmation which set the stage for the Christendom of the Middle Ages. (see picture right) Ambrose, Bishop of Milan, denies Emperor Theodosius even the ability to enter the Church – must less take the Eucharist. ‘The Emperor is in the Church,’ he claimed, ‘but not above it’. One result was that there were new expectations of Emperors: pagans had expected them to be valorous soldiers but also clement, austere and fair. (‘Emperor’ originally meant Commander of the Armed Forces). Ambrose, however, expected additional qualities: he praised emperors who were devout and humble, and who showed compassion. He expected them to be first in the faith. After the death of Emperor Theodosius, Ambrose praised him for ‘lowering the imperial banners in the dust and crying for his sins’. Ambrose was an interventionist bishop, disputing with the Emperor even about decisions affecting the Church in the Middle East, but he could also be extremely tactful: his legal train­ing had taught him to mix rigour with flexibility. Evidently, Emperors of barbarian back­ground, such as Theodosius who made Christianity the State reli­gion, admired Ambrose’s culture as well as his holiness. When the Arians were on the verge of getting the upper hand in Milan, Ambrose composed hymns to combat their teaching and, to retain control of the cathe­dral, he even defied pro-Arian troops. At a decisive moment he discovered the bones of two mar­tyrs, Gervase and Protase, which encouraged his flock. ‘Now I have my soldiers,’ he commented, ‘who are in the army of Jesus’. Despite a weak voice, Ambrose was a renowned preacher (many of his sermons survive) and a vigorous polemicist who, among other things, defended the recently for­mulated Nicean Creed which was under attack by Arians. One of his most important ser­vices was to inspire a certain teacher of rhetoric, who had come to Milan with his mother and son on the recommendation of the pagan Senator Symmachus, who had been a school friend of Ambrose and who was also prob­ably a relative. Ambrose was a strenuous defender of the order established by Rome which he tended to identify with Christianity. His fear was that, if this order disappeared, chaos would prevail. Perhaps, in Ambrose, the meld between Christianity and Roman culture was too successful. 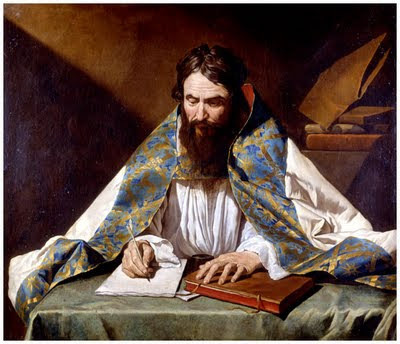 St Augustine went a step further for he claimed serenely that even if the barbarians conquered Rome, the City of God would prevail nevertheless. Towards the end of AD 396 Ambrose fell ill, and died later on Easter Sunday AD 397. Shortly before this, as prayers were offered for his recovery, he said, ‘I have not lived in a way which makes me ashamed to stay alive but I am not afraid of death either because God is good’. This article first appeared in The Messenger (January 1998), a publication of the Irish Jesuits.